I’m very happy to announce from April 2nd 2012 I’ll be presenting a brand new daily program on 76.1 Inter FM. LHR – London Hit Radio – will bring you the latest UK music, events, culture, fashion, guest interviews and London 2012 Olympics updates. Over the past 21 years I’ve built a fantastic network of UK-Japan connections – this program will connect you too!! You’ll also be able to interact with LHR in real time on our Facebook page. And that means I’m saying goodbye to Global Satellite which I’ve hosted every weekday for the past 3 years together with my wonderful co-host Sayoko Kamei. We’ve had such a laugh (on air & off!!). Sayoko and I have worked together for over 20 years – at FM Banana (yes really), Virgin Megastores and Inter FM. We’re both now keen to pursue different radio programs but I’m very happy that our new shows will be on air next door to each other from April. I want to thank Sayoko for being such a great colleague over the years. Last year she handled the March 11 earthquake entirely on her own live on air. I was not in Japan when the earthquake hit, as my father died the day before and I had already left the country. If I had been in Japan we would have been on the air together with our 10am-3pm Global Satellite broadcast. Sayoko ended up on air solo for 10 hours through the frightening confusion of that day. She deserves a huge round of applause and a big hug for that. 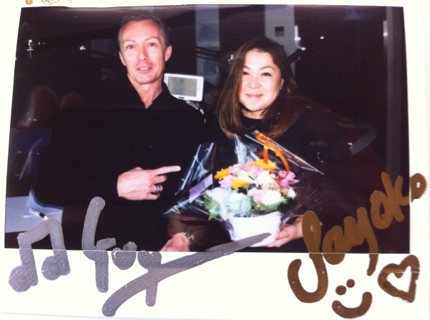 Thankyou Sayoko for years of fun and I wish you the best for your new show Radio Disco. However we are the Tuck & Patti of radio so I’m sure we’ll be back on the air together again one day!! 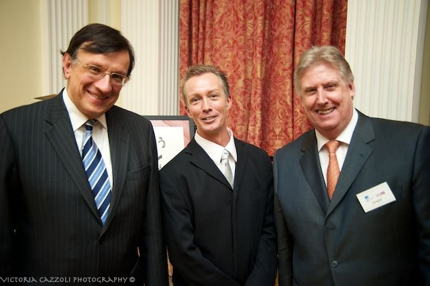 On Thursday March 8 2012 the British Chamber of Commerce Japan held the Road to Recovery event at the Ambassador’s residence of the British Embassy Tokyo. 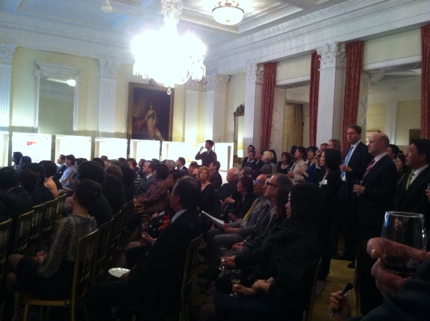 The event commemorated the March 11 2011 Great Eastern Japan earthquake and tsunami. There was a positive note to the evening seeing results from 12 month’s of fund raising and hard work from members of the BCCJ. 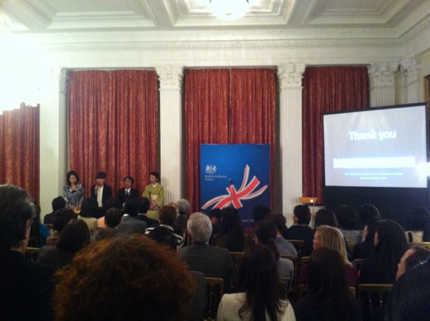 Four Tohoku residents shared their experiences of the past year and thanked the British community for assisting with rebuilding their lives – and reminded us not to forget about all the people of Tohoku who still need support. The British Ambassador Sir David Warren spoke about how inspired he’s been by the strength of the people of Tohoku and the generous spirit of the British business community. British music composer and producer Nick Wood premiered his track Hope featuring Julian Lennon and Tetsuya Komuro. Click on the play button below to listen to a quick comment from Sir David Warren and Nick Wood plus a short excerpt of Hope..
British Ambassador Sir David Warren, Guy and President of the BCCJ Phil Gibb. BCCJ Road To Recovery 2012. A dreamy mix of warm music for your soul. Influences from classical Europe, spiritual India, Balinese sunrises, African sunsets, Japanese heartbeats, Brazilian waves and the Milky Way viewed from the Great Southern Land. Click on the play button below & start dreaming..
Two photos from the Dream Children series photo shoot that I produced in the late 1980′s for my Dream Factory cabaret lounge events in Sydney. 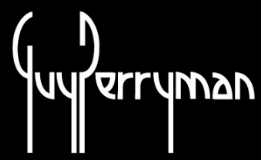 You are currently browsing the GUY PERRYMAN blog archives for March, 2012.